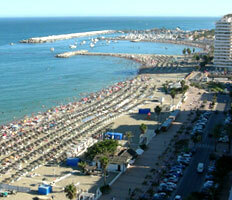 Fuengirola is easily accessible from the N340 and the A7 motorway. Located just 25 kilometres from Malaga Airport, you can travel to Fuengirola either by train, bus, car, taxi or transfer. Malaga Airport Transfers offers airport transfers to Fuengirola from 36 Euros/4 people. To book or view real time prices you can use the form on the top of this page. It would be difficult to get bored in Fuengirola, as there are any number of places of interest besides the sun-sea-beach activities. Perfect climate: in Fuengirola you can enjoy the sunny weather practically all year-round. In summer the day temperature can rise to 35ºC, which is perfect to have a swim in the sea or pool. The promenade and beach front: this 8km long stretch is lined with plenty of chiringuitos (beach bars), restaurants, souvenir shops and beach accessories on the other side of the road. The sea water is not too deep and is therefore ideal for older people and small children. 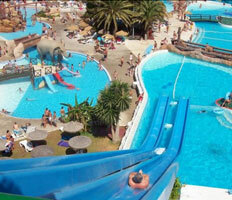 Most water activities you can think of are available at Fuengirola Beach. The promenade also has a cycle lane which can be used for those who like to cycle or roller-skate. Nightlife: Fuengirola lives at night, especially in summer and weekends, and there are plenty of bars and discos which are open until late. Sohail Castle: dating back to the 12th century this castle was built by the Almoravides and taken over by the Christian Army in 1485. You can visit the castle from Tuesday-Friday from 10am to 2.30pm. BioParc: Fuengirola Zoo is open from 10am until 12pm during the summer and until 6pm in winter. Decorated in African style (right down to a giant replica of a Baobab tree), the Zoo is famous for being animal-friendly and working together with animal programs. Plaza de Toros: Fuengirola's bullring is located next to the zoo. Shopping: in the centre you will find a wide range of shops, while just outside the town there's a commercial centre, Miramar, with some 160 stores, 12 cinema halls and restaurants, cafeterias and fast food outlets. 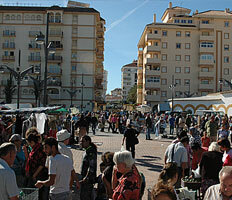 What's more you can attend the nearby flea market of Fuengirola every Saturday. Like the sound of Fuengirola and planning a visit? Find out more about the cheap airport transfers to Fuengirola we offer here. It’s simply the most convenient way to get around the Costa del Sol. 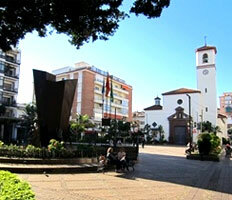 Fuengirola is very close to Mijas, Benalmadena, Marbella, Malaga and other destinations on the Costa del Sol.